En esta conversación en inglés, grabada en la playa del Bogatell en Barcelona, España, hablamos del ecologismo, también conocido como «The Green Movement» en inglés. Luego tratamos el tema del calentamiento global, el efecto invernadero, la deforestación (con especial atención al Amazonas), y qué medidas se están tomando para combatir el calentamiento global. También os descubrimos los países más contaminantes del mundo. Finalmente hablamos de movimientos alternativos, lo que implica el «Carbon Footprint» (la cantidad de carbono que cada individuo consume), el desarrollo sostenible, qué podemos hacer de manera individual para mejorar las cosas y lo que es probable que suceda en el futuro. En la clase de inglés que sigue al podcast, ya que como hablantes nativos usamos colores todo el tiempo en nuestro lenguaje diario, hoy os vamos a enseñar algunos colores nuevos y menos habituales que probablemente no habíais aprendido antes. ¡Visita nuestro canal de iTunes y encontrarás todos los archivos Mp3 de las Conversaciones en inglés, haz click en «Subscribirse gratis» y sé el primero en conseguir GRATIS nuestros podcasts más recientes de conversación! TOM: Hi I’m Tom and I’m sitting on Bogatell beach with Mark again, hello Mark! TOM: What are we gonna talk about today? TOM: Exactly! Now environmentalism is “a broad philosophy and social movement regarding concerns for environmental conservation, and improvement of the state of the environment in order to protect it from damage by human activities”. And what’s someone who speaks out about environmental issues called? TOM: Or an Environmentalist. Interestingly, ‘mentalist’ has a slang connotation; what’s a ‘mentalist’? TOM: Exactly, but they’re not insane or crazy, but uh…anyway, let’s move on. Can we talk about the history of environmental awareness? When did it begin, when did people first become concerned about environmental issues? In this English conversation, recorded on Bogatell beach in Barcelona, Spain, we discuss environmentalism – also known as «The Green Movement» in English. 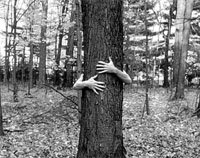 First we look at the history of environmental awareness – when humans first began actively caring for their environment, which country in Europe had the first serious environmental pollution (and why), and the rise of three famous environmental movements – Greenpeace, Friends of the Earth and the Chipko movement in India – also known as “Tree Huggers”. We then discuss global warming including the causes, the Green House Effect, deforestation (with a focus on the Amazon), and what measures are being taken to combat global warming. We also reveal the worst polluting countries in the world. Finally we talk about alternative movements, what our “Carbon Footprint” is all about, sustainable living, what we can do individually to improve things, and what’s likely to happen in the future. In the English class that follows the podcast, as native English speakers use colours all the time in their every day speech, today we’re going to teach you some new and more unusual colours that you’ve probably not learnt before.